"He couldn't digest failure," says close friend and one-time confidant, Dev Anand. "He was engulfed by depression because he always felt he wasn't able to give enough to his relationships and to his films," says Nadira, once his neighbour and friend. An air of loss and mystery continues to shroud the talented but troubled Guru Dutt's premature death in 1964 --- he was 39 when he died. A keen look at the director's classics shows a recurring appearance of a death wish. Even if one were to desist from reading too deeply between the frames, one conclusion leaps to the eye. Dutt's films are a testimonial to the popular belief: great art comes from great suffering. Guru Dutta Padukone's childhood would have confounded Freud --- there were no signs of a tortured soul. 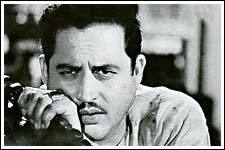 Born on July 9, 1925, near Banglore, to erudite, middle-class parents, Guru Dutt was enamoured by dancing. After a stint at Uday Shankar's Dance Academy in Almora, Guru Dutt wired home to say he had got the job of a telephone operator in Kolkata. But he disengaged himself from the job soon and bagged his first film assignment as choreographer, in Lakhrani (1945). The second half of the Forties were a period of struggle. Dutt played a small role in Prabhat's Hum Ek Hain (1946) which brought him in close contact with fellow newcomer Dev Anand. Dev and Guru Dutt double dated, swapped shirts, and also shared a pact: if Dev ever produced a film, Guru Dutt would direct it. If Guru Dutt ever made a film, Dev would star in it. Dev made it first and gave Guru Dutt the promised break as director with Navketan's Baazi (1951). Baazi [Dev Anand, Kalpana Karthik and Geeta Bali] had shades of the Film Noir movement of Forties' Hollywood --- the morally ambiguous hero, the transgressing siren, shadowy lighting. Baazi created a major buzz and Dutt followed it with a more noirish thriller Jaal (with Geeta Bali trying hard to resist bad boy Dev's illicit charms). The director graduated to hero opposite Geeta Bali in Baaz (1953), an eminently forgettable fare. On a brighter note, he married singer Geeta Roy in the same year. Geeta sang some unforgettable songs in his films for years to come. Guru Dutt's breakthrough as actor-producer-director came with Aar Paar (1954). This entertaining crime thriller was a gutsy venture with a music director (O P Nayaar) who had yet to give a hit film and two heroines who were hardly major stars (Shyama and Shakila). Interestingly, one running theme in most of his films was the other woman. In Baazi, Kalpana was the conventional heroine and Geeta Bali the moll in love with Dev. In Aar Paar, Shyama was the one he loves while Shakila was the second lead. Shakila was promoted to heroine in C I D while newcomer Waheeda played the vamp. Pyaasa starred both Mala Sinha and Waheeda Rehman. By a strange coincidence, Waheeda and more profound concerns entered Dutt's films with Pyaasa (1957). This sombre, nihilistic film was a marked departure from Dutt's light-hearted romantic entertainer Mr And Mrs 55 (1955). Pyaasa (which Dutt had originally planned with the heart-stopping combination of Dilip Kumar-Nargis-Madhubala) was about a poet betrayed by his lover, disowned by his brother and short-changed by his publisher. In the finale, the poet forsakes all of them and fame, seeking solace in the arms of a social outcaste, the streetwalker Gulab (Waheeda Rehman). Replete with symbols, Pyaasa lamented the inability of a prosecuting world to understand the purity of a genuine soul. In the Sahir Ludhianvi gem, Yeh duniya agar mil bhi jaye to kya hai, Dutt posed as though at a crucifixion. Those who missed Dutt’s obvious allusions to the Son of God were still enraptured by Dutt's engrossing storytelling, his flair for song picturisations and his inherent ability to extract the best from four talented actors --- Waheeda Rehman, Mala Sinha, Rehman and Dutt himself. After its success, Guru Dutt braved one more film on the transient nature of stardom and fame, Kagaz Ke Phool. With V K Murthy's still-admired cinematography, Dutt created some unforgettable visuals in the film: the image of filmstar Waheeda running after her mentor Dutt only to be held back by autograph hunters still finds an echo in films like Hum. Kagaz Ke Phool won raves for Dutt but set him back by Rs 17 lakh --- a huge sum those days. Dutt produced a Muslim social Chaudhvi Ka Chaand (1960) with an eye on the box office. The title song became a rage and the film filled Dutt's coffers. Devastated and disillusioned by Kagaz Ke Phool's failure, Dutt never signed a film with his name again. His next was the wonderfully atmospheric Sahib Biwi Aur Ghulam (1962). To date, the controversy rages on: did Guru Dutt ghost direct the film or did Abrar Alvi, whose name appears as director in the credits, really call the shots? Set in a crumbling 19th century haveli, symbolic of the slow decay of feudalism, the film told the tale of the lovely yet unloved chhoti bahu (Meena Kumari). Spurned by her husband yet desperately in love with him, she seeks support from her ghulam, Bhootnath (Guru Dutt), and increasingly from alcohol. Sahib Biwi Aur Ghulam couldn't stop Dutt's life from falling apart: his parting with Waheeda when she sought to establish her own identity outside his films hurt Dutt. A last ditch effort to reunite with estranged wife Geeta also failed. Dutt was addicted to paan (he had an ornate spitoon at his Peddar Road house in Mumbai), also began drowning his woes in alcohol. A few days before he died on October 10, 1964, Dutt met Dev, expressing a desire to cast him in his next film. Dev agreed, and asked to hear the script. Dutt, now a pale shadow of himself, didn't return, succumbing instead to an overdose of sleeping pills. Picnic with upcoming star Sadhana remained incomplete. As did K Asif's Love And God costarring Nimmi (Sanjeev Kumar replaced Dutt and it was released two decades later). Brother Atma Ram completed Dutt's own venture Baharein Phir Bhi Aayengi (with Mala Sinha and Tanuja), after reshooting Dutt's portions with Dharmendra. If only Dutt had heeded the life-affirming title song from Baharein Phir Bhi Aaayegi: Badal jaaye agar mali, chaman hota nahi khali [Even if the gardener changes, the garden will not stop sprouting flowers].